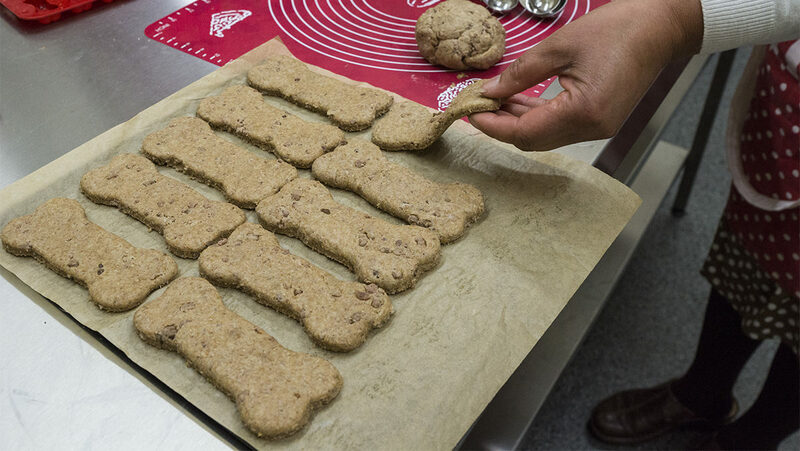 Marge and Mabel’s Homemade Dog Treats was borne out of my love of food and dogs. I’ve always wanted to work for myself, and after the success of my first sell-out stall at Chesterfield Market one Saturday in 2013, I knew this was where my passion lay and threw myself into creating a quality business, selling quality products. I create all the recipes myself and continually strive to improve the existing range and to create new treats. So be sure to keep an eye out for new additions and special edition ‘guest’ treats. All our ingredients are sourced in the UK and we buy as much as we can locally, eg meat from our local butcher, flour from Caldwell’s Mill and organic fruit and vegetables from our local grocer who delivers weekly. As well as being able to buy from our website, we are regulars on Chesterfield’s Artisan Market and frequently support local and national events. We can also be found at events such as Chatsworth Country Fair and Christmas Fair and supply an increasing number of outlets in and around Derbyshire and South Yorkshire, including Furst Class Lounge Grooming Salon, Marsh Green Farm Shop, Elsecar Heritage Centre. Our growing success meant the kitchen at home soon became too small and we now have an industrial unit with top-class stainless steel fittings and state-of-the-art ovens. Anyone is welcome to drop in for a coffee, take a look at our facilities and have a chat about any requirements – you may even see Marge and Mabel there. Of course, feel free to bring your dog and they can have a free taster of whatever we’re baking at the time.